My work life and social life leave me without a lot of "me" time! Because life has been so busy for a few years now, I hadn't invested much time in making healthy food and exercise choices. Then in 2014, as I was about to turn 30 and had officially crept into the obese category, I decided to make a goal of losing 30 pounds before my birthday. With the help of DietBet, I met that goal and then some. Last year, I lost a total of 55 pounds, hit a healthy, "normal" BMI for my height, and have managed to keep the weight off for over 6 months so far. I'd done Weight Watchers for over a decade with some temporary success, but never kept the weight off. 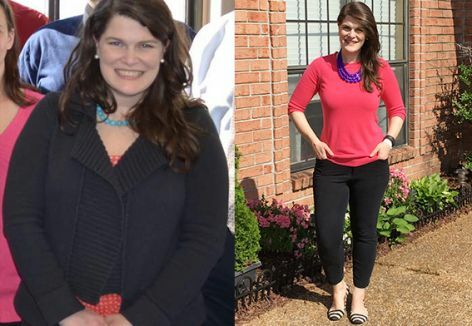 Once I joined DietBet, I quit Weight Watchers, lost more weight than ever, and have actually kept it off. Instead of paying a lot of money for a fad weight-loss program, I love that I get paid for doing what works best for me. The mix of small goals and financial incentives was key. Weighing in once a month was great, because it was enough time that I could have a few not-so-great days per month, but still stay on track. And--I'll say it--I'm pretty cheap, so the thought of losing a few dollars when I didn't make my goal was unappealing! Even now, as I'm more in maintenance mode, I'm doing my third Transformer game. For the first time in my DietBet history, I haven't made a few of my goals, but even having the accountability of weighing in and aiming toward that 10% goal has been a huge part of my maintenance process. Having the pictures from each weigh-in has also been really inspirational. It amazes me to look back at the photo from my first weigh-in in January 2014 to the most recent one. I love that, through DietBet, I have pictures to compare directly how far I've come. Oh, and winning money is pretty fun, too! Even though it seems too good to be true, DietBet really is a way to reward yourself for losing weight. And there's no better day to start than today!